More great results for Ros’ horses last week – not least the win by Grafics, piloted by Richard Jones. In four runs this season Grafics has posted four double clears – and at Norton Disney bagged his first novice win. Alex Postolowsky had Izilot DHI and Lordships Parc Royale in the BE100, double clears leaving them 12th and eighth respectively. Still at Norton Disney, Ros’ head girl Georgie Frow rode DHI Jura in to third place in the BE100Open, completing on a very smart 21.3 dressage score, while Chas Smash also put in a good performance at just his second affiliated event to finish mid-field in a BE100. Her own Kiltycreighton Boy was just out of the ribbons in the BE100Open, despite a double clear. 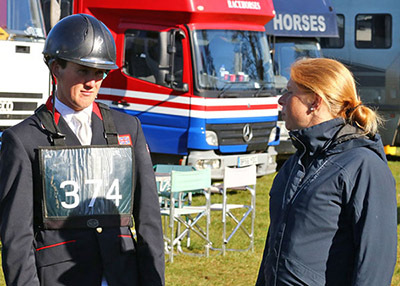 Meanwhile down at South of England, Rehy Royal Diamond put in a great performance under Tom McEwen to finish third in his intermediate section.